How about a quickie at four? True to their name, these Four o'clock moths (Dysphania numana)) are usually active late in the afternoon, and it is uncanny how many times we have observed them around 4pm. In this case these couple turned up mating at our home at about 4.30pm. 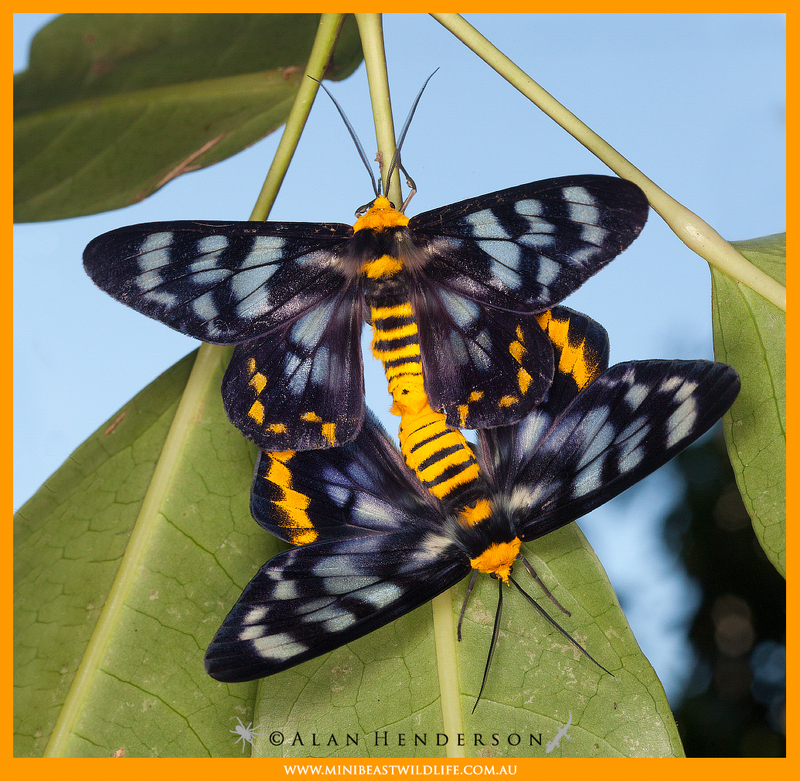 The host plant for these moths is Corky Bark (Carallia brachiata), and the caterpillars are just as spectacular as the moths. See one in this previous post. 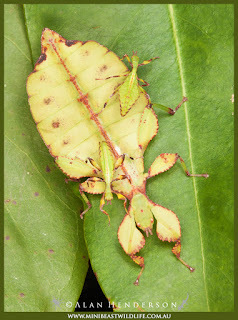 Here are some of the Phyllium monteithi Leaf Insects we have been breeding. One of our populations originated from a single female specimen that Gerhard Hillmann and myself happened across after Cylone Ita last year here in Kuranda. Gerhard spotted the adult female sitting upon Golden Penda (Xanthostemon chrysanthus). A rare find as she was only the second female specimen ever found at that point. The first was also found in Kuranda in 2012 on Cape Ironwood (Gossia floribunda). 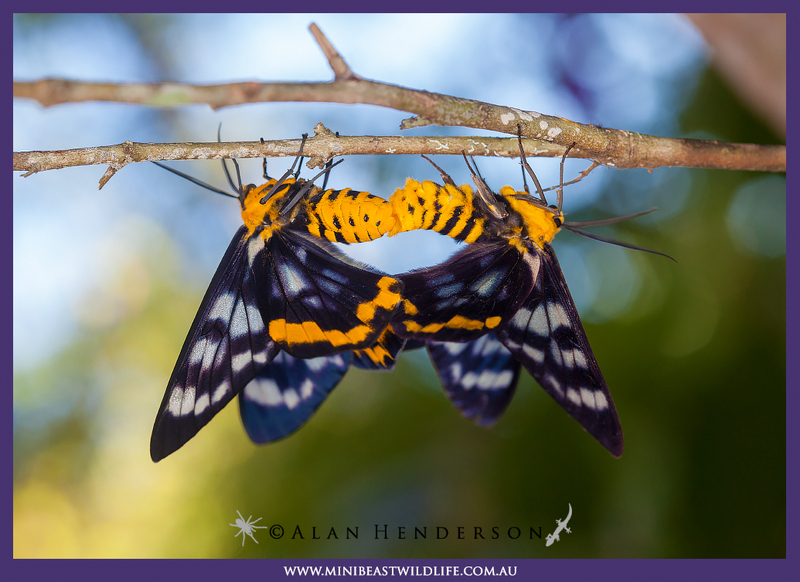 The offspring from the Cyclone Ita female have been kept on Golden Penda and are exhibiting an array of colours. The other main food plant we use is Brush Cherry (Syzygium australe), which is also likely to be a wild food host plant for this species. The wild female in the position she was found on Golden Penda. 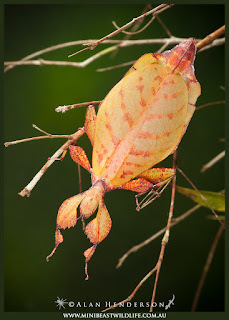 The red colouration makes the insect obvious in this image, but would provide good camourflage on some of the rusty red coloured Penda leaves. A female offspring from the wild female above with more red flecks. An large female nymph with some 1st instar nymphs on her back. 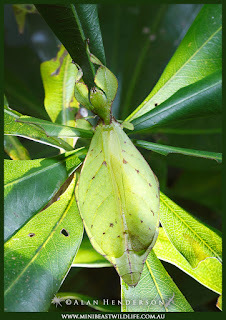 An adult female on Golden Penda. 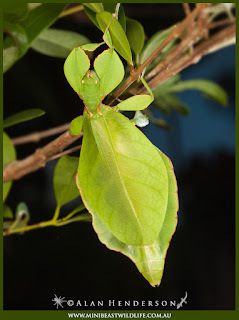 An all green female raised on Syzygium australe. A brilliant green juvenile female. 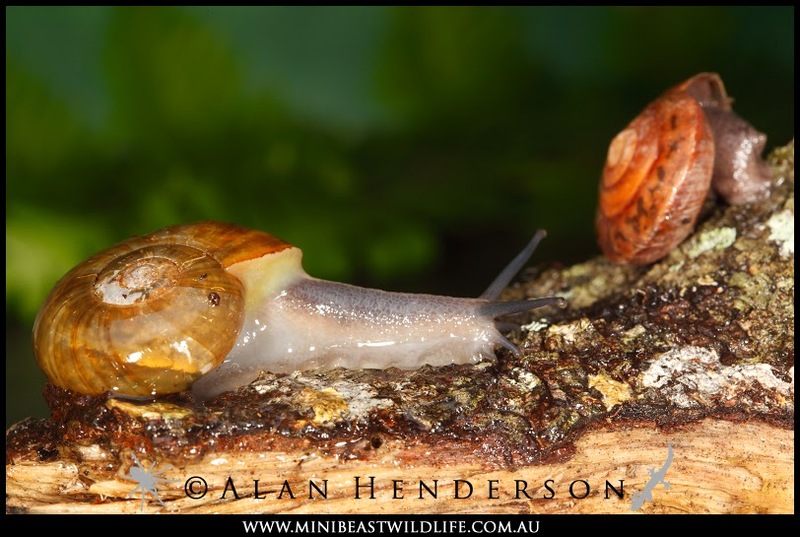 While 'carnivorous' and 'snail' are two words that most people wouldn't expect to find next to one another, these slow moving predators are actually quite common in some regions of the wet-tropics. 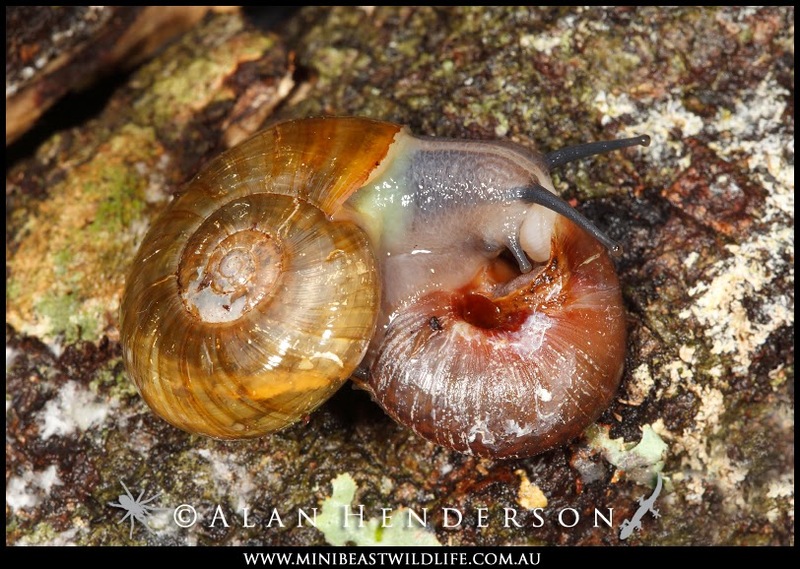 This is one of our local carnivorous snails, Strangesta sp. 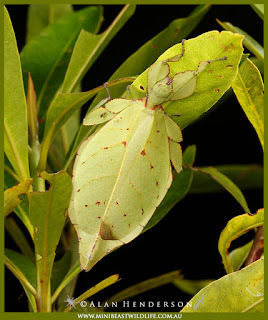 (Rhytididae). Here is a series of photos showing it attacking and consuming a young Hadra webbi. 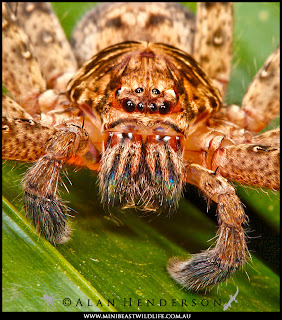 Strangesta spp. have an extendible mouth part known as the buccal mass. 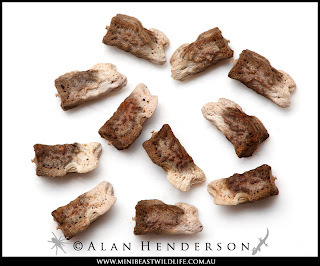 It is a long, cylindrical muscular organ - the white tissue visible in the last image. This is extended inside the shell of the prey to enable the radular to access the soft tissue. 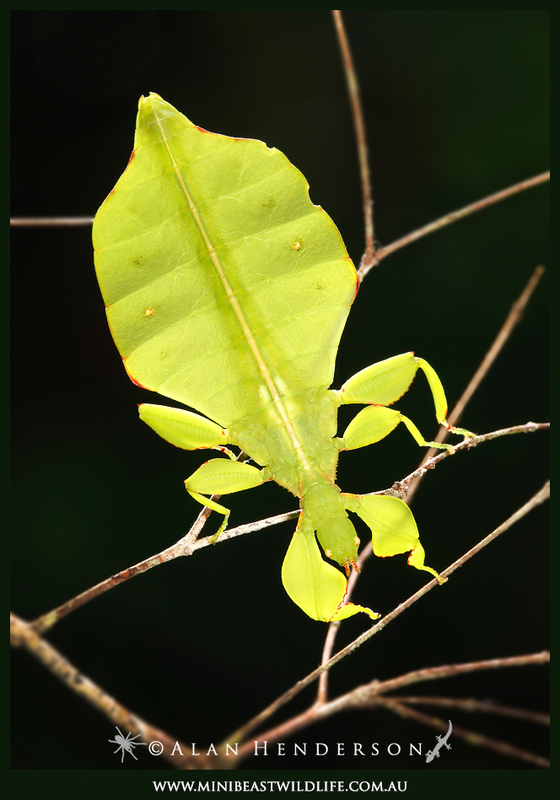 For a while now we have been captive breeding a genetic population of 'lichen-form' Crowned Stick Insects (Onchestus rentzi). 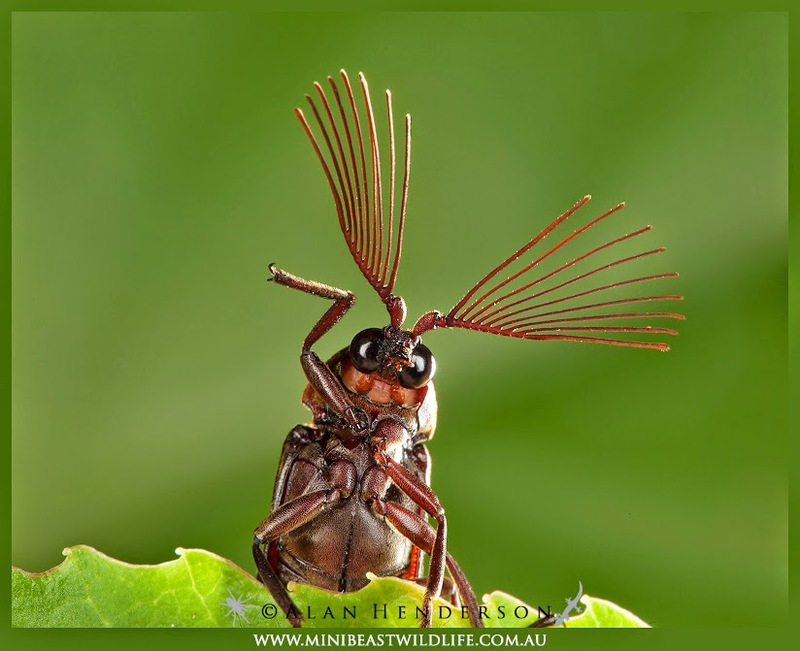 Although these insects are somewhat variable in colour, the most common colour form is brown. Over recent years we have noticed some individuals within our main breeding colony exhibiting a lichen-like trait. Last year we decided to experiment with a few of those to see if the trait was genetic or the result of environmental influences including lighting and food plant. We separated three young lichen-form females and let them mature in isolation, but kept them under the same conditions as our main group. The three females matured and began to lay eggs without being mated. The species is believed to be parthenogenetic but we had never tested it, so we were quite interested to see if the eggs they laid were even fertile. 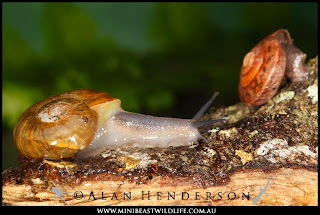 Those eggs are now hatching and the resultant offspring are indeed the same colouration as the females that produced them. 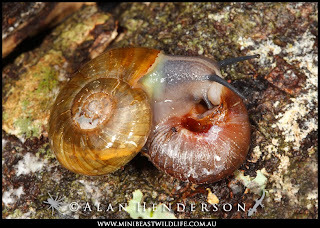 Two or the original three females are still alive and laying eggs on a daily basis. Recently though, the eggs that they are producing are different in appearance than previously. 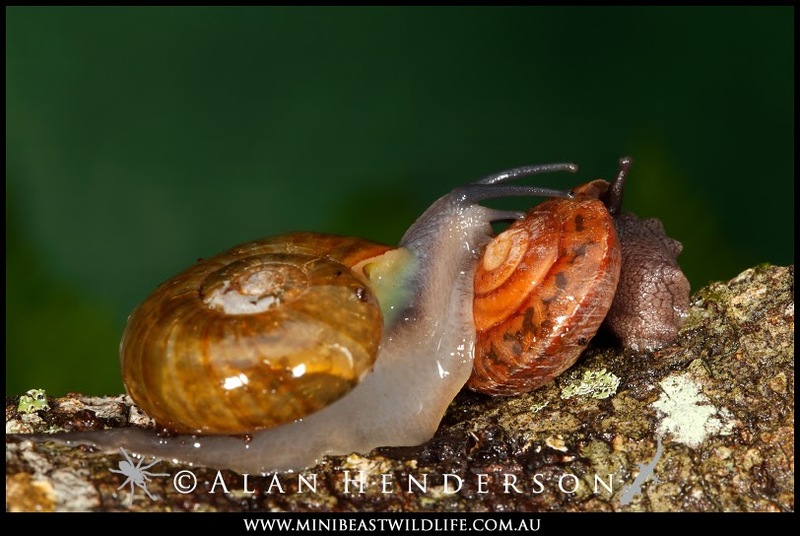 Normally the eggs are uniform brown, ranging from tan through to a chocolate colour - exactly what these individuals have been producing until now. These recent eggs are two-tone like the insects themselves, with a splash of white across the posterior end. We are not sure why this is occurring but will continue to observe and document these insects with interest. 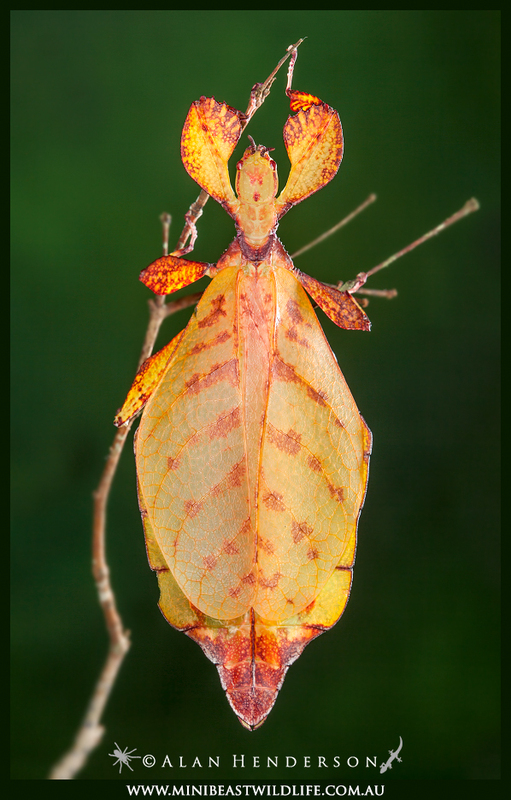 One of the original 'lichen-form' females. The eggs laid recently exhibiting an unusual colour trait. We accidentally broke open a mud-dauber wasp nest under our house while moving some equipment. 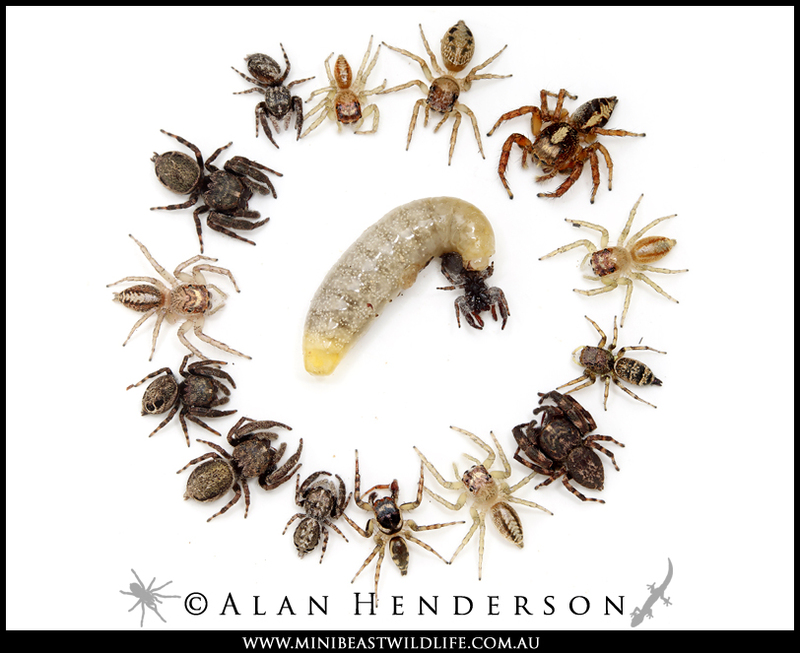 The mud cells were packed with paralysed jumping spiders of multiple species. The culprit was a slender orange wasp belonging to the genus Sceliphron obviously specialising in spiders from the family Salticidae. The adult female wasp captures and paralyses the spiders and then packs them into the mud cells. She then lays an egg before closing the cell over with mud. 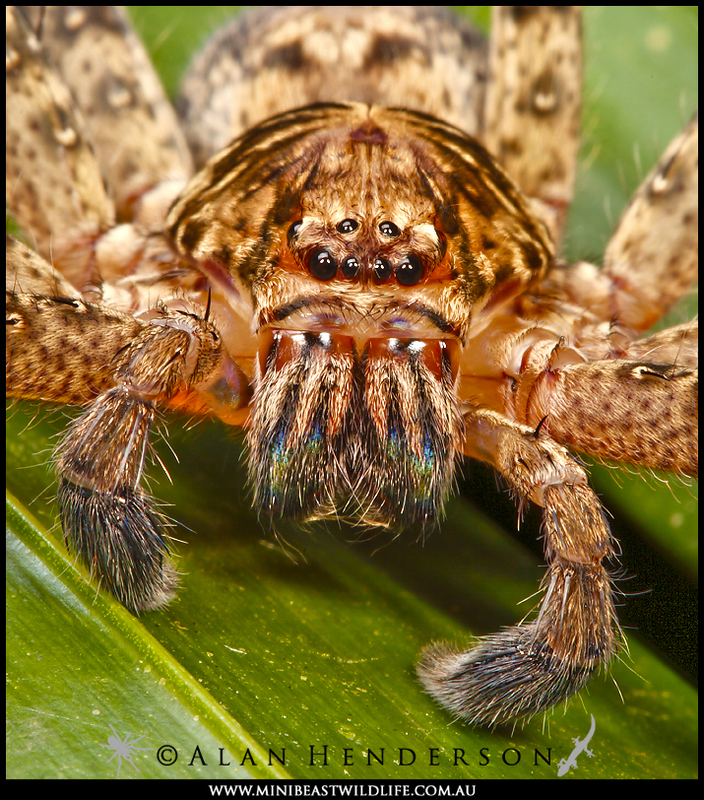 The spiders are paralysed, but not killed so that they do not rot and the wasp larva can consume them over time. I rearranged the contents of one cell for this photograph. 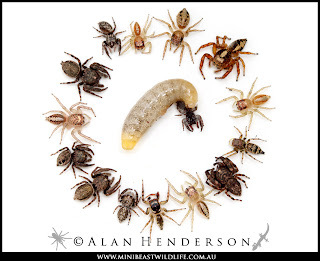 A wasp larva is in the centre in the process of consuming a spider. It has been quite a while between posts, time flies! We've been busy running our Minibeast Wildlife operation and working on a book...or two! We are currently working on the first of a series on the husbandry of Australian phasmids. To get things rolling again here are some images taken over the past few months around around our region. Cotton Harlequin Bug, Tectocoris diophthalmus. 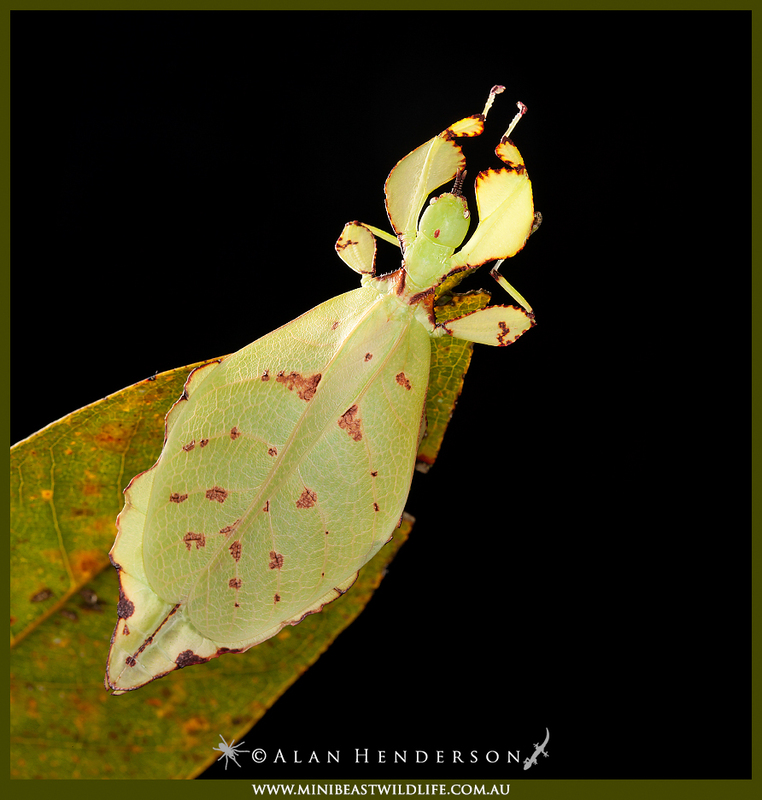 This species can be found feeding on a variety of Hibiscus spp. A very cryptic crab spider, Stephanopis sp. 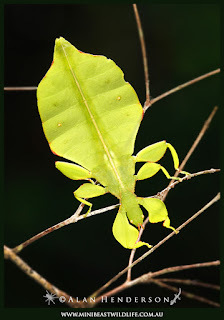 A hatchling Kirby's Stick Insect, Xeroderus kirbii. 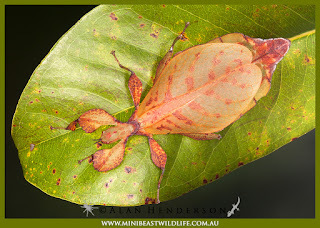 This specimen was found on Melaleuca just west of Kuranda. Argyrodes sp. These bizarre spiders are kleptoparasites found in and around the webs of the large orb-weavers Nephila pilipes. 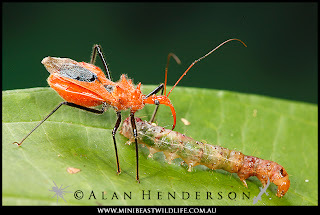 An assassin bug Gminatus sp. feeding upon a caterpillar.